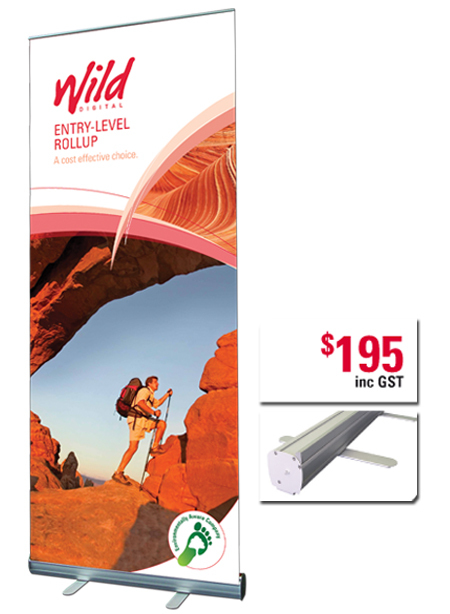 Wild Digital - Entry-level rollup - retractable bannerstand. The entry-level rollup is the most cost-effective bannerstand in our product range. Even though it is an entry-level product but it doesn’t skimp on features or quality. The entry-level rollup base and pole are made from lightweight extruded aluminium giving it the same stylish appearance as its more upmarket cousins. The high-resolution graphic is printed directly onto a high-quality synthetic substrate with UV resistant inks. The UV resistant inks ensure the graphic resists fading from direct sunlight. The strong graphic substrate will not tear easily. Lamination isn’t required which reduces both the cost to you and its environmental impact. The Entry-level Rollup uses a single roller mechanism to retract the graphic into the base unit. The graphic is safely stored and protected in the base. This bannerstand is only available in one size. Replacement graphics are available for all rollup banners so you can reuse the base for a long time. Rollups come with a 10 year manufacturers warranty. Rollup bags are not included in the warranty. Sizes: 845mm wide by 2100mm high.